One of the University’s foremost experts on how marine science is translated into policy has been invited to London to speak with MPs, Lords, and Minsters about the work she does. 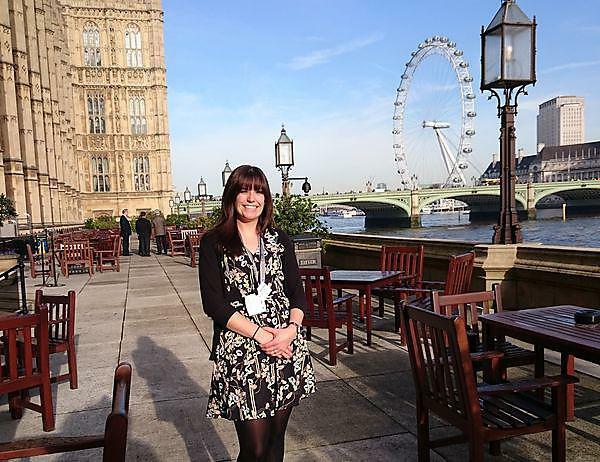 Dr Abigail McQuatters-Gollop was asked by the Natural Environment Research Council (NERC) to a parliamentary reception at the House of Commons last week, to talk with government representatives on how scientific evidence helps to inform the policy-making process surrounding the management of marine ecosystems. Dr McQuatters-Gollop is a NERC-funded Knowledge Exchange Fellow within the School of Biological and Marine Sciences, and plays a significant role in the delivery of the EU’s Marine Strategy Framework Directive, as the lead scientist for pelagic habitats for both the UK, and the North Atlantic. The pelagic zone encompasses life in the water column, with a particular emphasis on plankton. As the base of the food web, the environmental status of plankton is intrinsically linked to the health of the species that depend directly and indirectly upon it. Dr McQuatters-Gollop works with counterparts in countries like France, Spain, Sweden, Germany and the Netherlands, as well as UK agencies such as SAHFOS, PML, CEFAS, SAMS and the Environment Agency, to determine whether pelagic habitats are in good environment status. This they do using plankton indicators to provide information on the state of marine biodiversity, invasive species, food webs, and seafloor integrity. "Organisations such as NERC are vital to that process of gathering evidence, so it was a great opportunity to meet with Ministers, MPs and Lords to offer them an insight into the work that takes place to support the creation of policy. Dr McQuatters-Gollop, who is invited by countries around the world to talk about the importance of establishing close relationships between scientists and policy-makers, is in the process of delivering her OSPAR (the current legislative instrument regulating international cooperation on environmental protection in the North-East Atlantic) and UK assessments on the environmental status of pelagic habitats, and these will then pass through a period of consultation on their way to the European Commission by 2018.